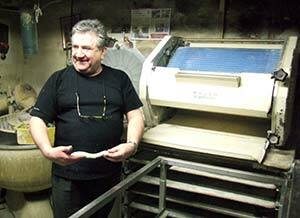 ABOVE: Claude Esnault holds an unbaked baguette from a loaf-forming machine in his boulangerie-patisserie, which has produced bread since the time of Napoleon. INSET BELOW: Mimi, the bakery cat. See more photos. January, 2013 update: After more than 200 years, Boulangerie Patisserie Au Grand Richelieu has been forced to close because of a rent increase. Claude Esnault, the good-natured proprietor of the Boulangerie Patisserie Au Grand Richelieu in the 1st arrondissement of Paris, wasn't born into baking: He was a farmer's son in Normandy before moving to Paris in 1963 and learning the art of the boulanger. He acquired his current bakery and pastry shop six years later, turning the compact storefront on the Rue de Richelieu into an operation that--at its peak--produced some 4,000 baguettes per day. Today, the bakery's daily output is a more manageable 400 baguettes, along with some 200 croissants, 150 pains au chocolat, and a large variety of delectable gateaux and pastries. Customers include residents and restaurants in the neighborhood and the adjacent 9th arrondissement. M. Esnault's research indicates that Au Grand Richelieu is the oldest bakery in Paris--dating back to 1810, when "Napoleon could have come here," as the jovial baker reminds visitors with an expression that's more amused than deadpan. M. Esnault is assisted by his wife, this daughter, another baker, and a pastry cook; the store is open seven days a week, with the staff working both upstairs (where bread is mixed, risen, and baked) and down in the basement (where croissants and other pastries are made, and which is reached via a steep ship's ladder). We visited M. Esnault's bakery-patisserie during a Saturday-morning tour with Meet the Parisians at Work. The bilingual tour, which cost only five euros, included hands-on practice in slashing baguette dough and rolling mini-croissants, plus the chance to sample ingredients from the pastry chef's Easter chocolates. You'll find the Boulangerie Patisserie Au Grand Richelieu at 51, rue de Richelieu, 75001 Paris near the Pyramide Métro stops (lines 7 and 14). The shop's telephone number is 01 42 97 47 85, but don't try to book a tour with the bakery--use the Meet the Parisians at Work calendar and booking form at Meetingthefrench.com. Be sure to see our captioned photos on the next page and the related articles and Web links below.